If Clarence Clemons’ sudden passing sparked fears that the E Street Band’s days were numbered, then Wrecking Ball proves that it just gave them even more of a reason to fight. And though it’s no masterpiece, Ball is arguably Springsteen’s angriest, most explicitly political album to date, and with America slipping into an unsure future of extreme opinion and economic turmoil, it couldn’t have been more timely. Opening with “We Take Care Of Our Own,” he alternates between bitter indictments (“There ain’t no help/The cavalry stayed home”) and ironic “Born In The U.S.A.”-style proclamations (“Wherever this flag is flown/We take care of our own”). It’s a rallying cry that sets the tone for the rest of the record, where he takes aim at all manner of “fat cats” and politicians that shift unnecessary burdens onto the working man. Admittedly, this doesn’t sound too different from past Springsteen sentiments, but there’s an unwavering devotion to message here that differentiates this record from many of his others. (And if for whatever reason the lyrics don’t tip you off, titles like “Death To My Hometown” and “This Depression” definitely will.) While it’s hard not to wish Springsteen would sometimes approach this subject matter in different or more creative ways, it’s equally as hard not to be caught up in his passionate fury, especially when he offers words of hope as the album winds down. But there’s a good chance Wrecking Ball will most likely be remembered for its music. Springsteen has rarely taken so many chances in the studio, at least not on this scale. At its core, the album is a series of communal country-folk songs, akin to We Shall Overcome: The Seeger Sessions, but Springsteen and producer Ron Aniello pile loads on top, throwing everything they can at the wall to see what sticks. At times it pays off: the bristling energy of “Death To Our Hometown”‘s Celtic folk turns a protest into a pub singalong; the epic “Land Of Hope And Dreams” borrows from Woody Guthrie’s “This Train Is Bound For Glory” and features one of Clemons’ last sax solos; “We Take Care Of Our Own” charges on like prime Arcade Fire, themselves disciples of the Boss. Yet, at the same time, the stab at rap on “Rocky Ground” feels tossed off, and as a whole, the record sounds a bit bombastic and overproduced, as if intentionally drawing attention away from the occasional dips in songwriting. 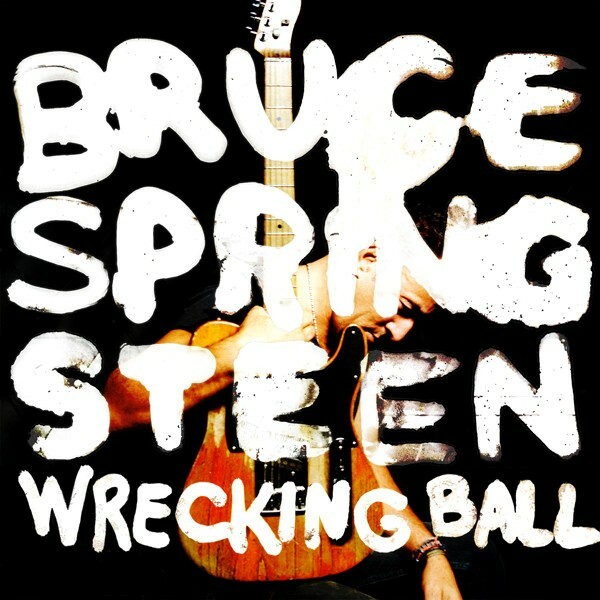 As Wrecking Ball plays, it’s difficult not get the sense that Springsteen is sometimes trying a little too hard to sound relevant, but the album’s best tracks work against this notion, and in these moments, it feels like you’re right beside Bruce, fighting the good fight.